§ 61.43 Practical tests: General procedures. (5) Demonstrate single-pilot competence if the aircraft is type certificated for single-pilot operations. (b) If an applicant does not demonstrate single pilot proficiency, as required in paragraph (a)(5) of this section, a limitation of “Second in Command Required” will be placed on the applicant's airman certificate. 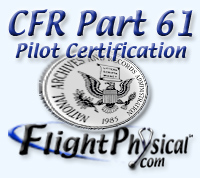 The limitation may be removed if the applicant passes the appropriate practical test by demonstrating single-pilot competency in the aircraft in which single-pilot privileges are sought. (c) If an applicant fails any area of operation, that applicant fails the practical test. (d) An applicant is not eligible for a certificate or rating sought until all the areas of operation are passed. (2) Due to inclement weather conditions, aircraft airworthiness, or any other safety-of-flight concern. (4) Presents to the examiner for the retest a properly completed and signed application.